Zinefest is an annual daylong festival devoted to zines, which are DIY print publications generally produced by amateur writers and artists. This year, it was held at the Museum of Printing History, which is a symbolically appropriate venue. But it did have one problem--it was really cramped. Considering how Zinefest has grown over the years, that's not surprising. The first Zinefest I went to was at the Caroline Collective a few years ago, and all those zinesters would have fit into one room at the Museum of Printing History. Zinefest 2013 was in four rooms (and in a few other nooks and crannies) and was bursting at the seams. The exhibitors and fans tended to be on the young side. Dress was very casual. It was definitely a different crowd from the Texas Contemporary Art Fair, which was running simultaneously. Let's face it--when you pay $10,000 for a booth, the stakes are high. But $25 or so for a table? It permits a more easy-going attitude. 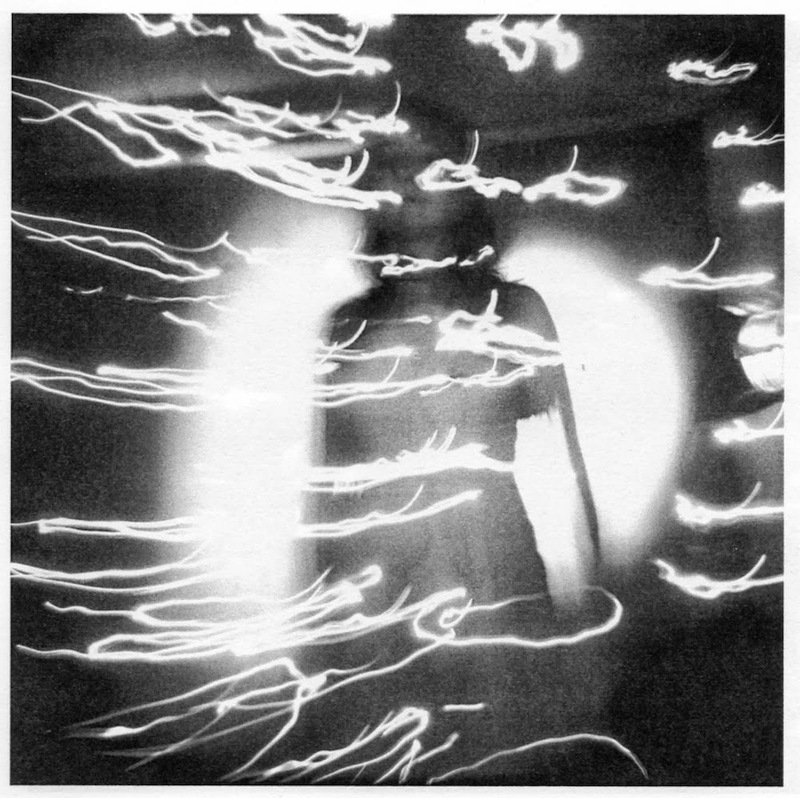 Zines exploded in the 70s as photocopying technology got cheaper and cheaper. That was the beginning of the punk zine, where music fans wrote about their favorite local bands--bands (and scenes) that otherwise got very little positive coverage in the local media. At the same time, mini-comics--small self-published comics zines--started to grow in number. One thing to remember here is that almost all of these were traded through the U.S. Mail. there were a small number of other venues (permanent and pop-up), but mostly it was people contacting like-minded people through the mail. Learning about other zinesters was difficult. 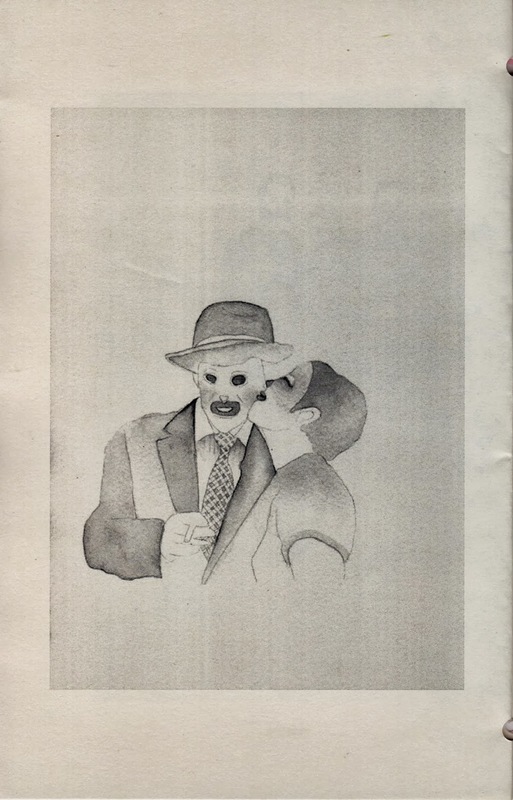 That changed when Factsheet Five, a magazine devoted to zines and listing hundreds of them in each issue, started publishing in 1982. It ran until 1998, which is auspicious. By 1998, the internet was getting big. The internet obviates the need for most zines. But the labor-intensive aspect of creating a physical zine, not to mention the fraught efforts to make contact with people who might be interested in reading your zine were made unnecessary by the coming of the internet. First came BBSes, which allowed fans to converse directly with other fans of whatever specific interest they had. Then came webpages, then blog software, then MySpace, etc. If you are into underground music or writing poetry or making comics (or writing about art, like me), there is almost no barrier to communicating with like-minded folks on the internet. So why keep making zines? That was something I asked myself that Saturday as I wandered the aisles. None of the people here needed to make zines in the way that people in the 60s, 70s and 80s did. They have other options that earlier zinesters could only dream of. And yet, here they were. Here's a selection of the zines I got at Zinefest. Perhaps looking at them will help explain why they still exist. This sloth version of Napoleon Crossing the Alps by David is by Houston artist Sebastian Gomez de la Torre. 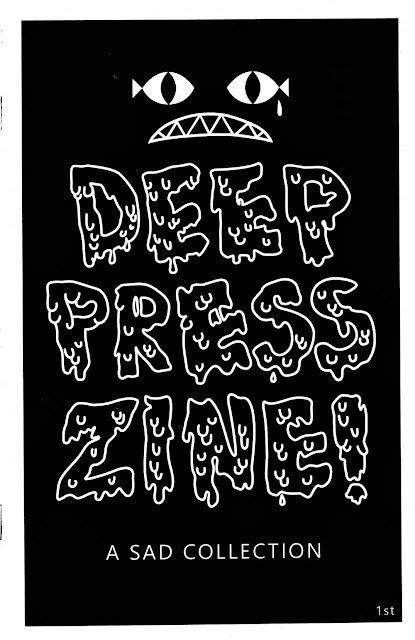 He also was presenting a zine full of his illustrations called Deep Press Zine. Women Artists: Interviews, volume 1 is an ambitious art-zine. Obviously this kind of project has a lot of appeal for me as an art-blogger. The credits on the zine are a bit vague, but I get the impression that Caroline Knowles is the editor/publisher. 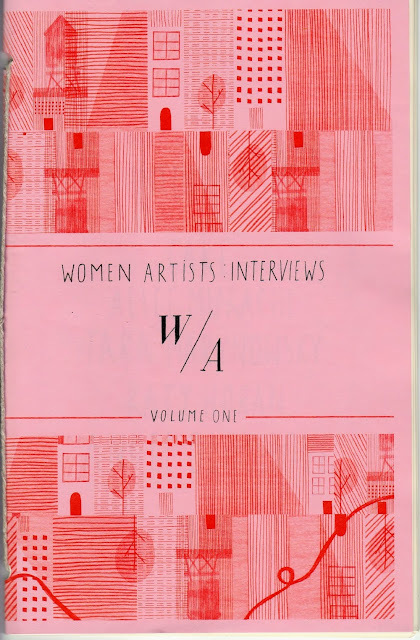 The zine consists of interviews with five artists conducted by Knowles, Rhiannon Platt, and Tricia Gilbride. I'm pretty sure that this zine is produced in Austin, and two of the artists interviewed, Katy Horan and Angel Oloshove are from Austin and Houston respectively. But the other artists are from all over--Tara Marynowsky, whose work appears above, is from Sydney, Australia. By calling this "volume 1," the creators of this blog imply future volumes. I look forward to seeing them. Abstract Comics comes from Beaumont. It was made by four Lamar students--Jon Nguyen, Andre Woodard, Jensyn Hanley and James Lang for a class, Design 1. 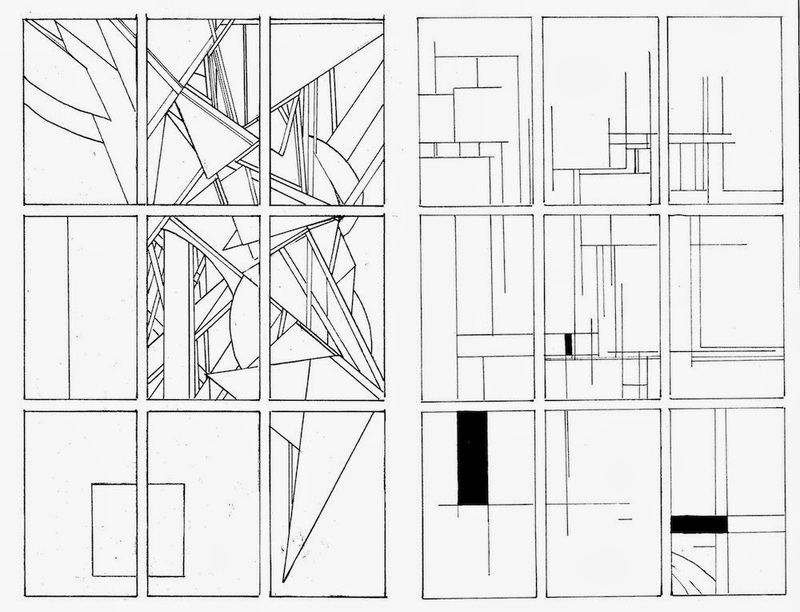 It is one continuous work, so it is impossible to know who drew what, but the individual styles are fairly distinct. The structure is abstract images within a strict 9-panel grid. 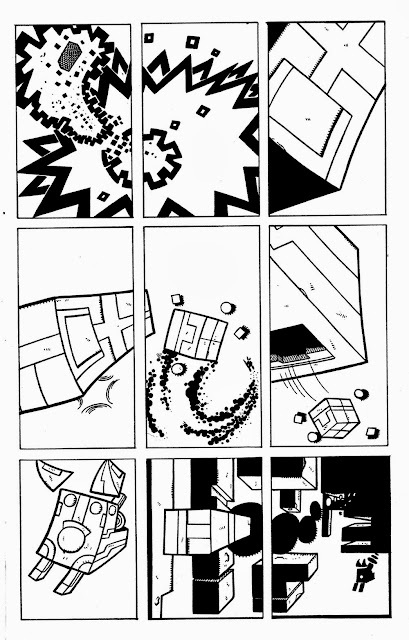 The visual tension is between images that overlap the grip and images that progress from panel to panel. It's a lovely exercise to give to young design students. 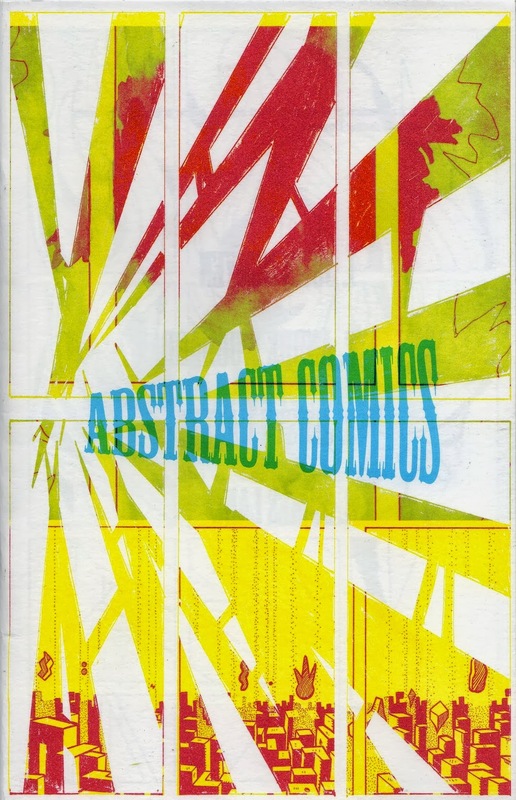 I wonder if they came up with the idea on their own or if they were assigned to produce an abstract comic. Either way, the result is charming. You can imagine that these young designers might have been exposed to Kandinsky and Mondrian and Paul Rand for the first time and were eager to show what they had learned. But classic comics design enters the work, too, as in this Jack Kirby-esque page. I'm not sure how you can buy a copy of this zine, but it was published by ZAD Projects. 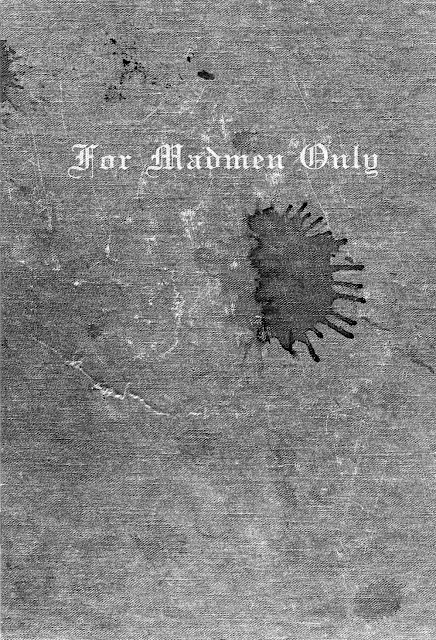 Another ZAD projects zine is For Madmen Only. This one is by ZAD himself--Zachary Dubuisson. It consists of spooky, nighttime photos with mysterious light flares and ominous silhouettes. For Madmen Only can be read as a photo essay or as a mini-portfolio. I've been told that for a lot of photographers, the goal of a given particular photographic project is a book. A zine can be a way to document a small project--an assay into a what might become a larger body of work. 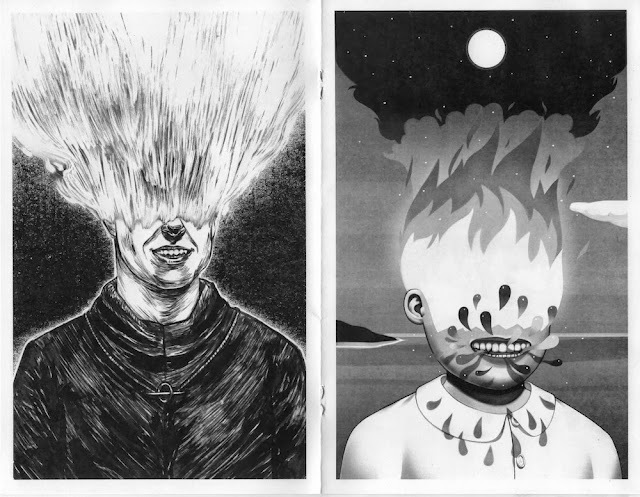 Zines have always been about personal expression, so memoir is a common genre for the form. 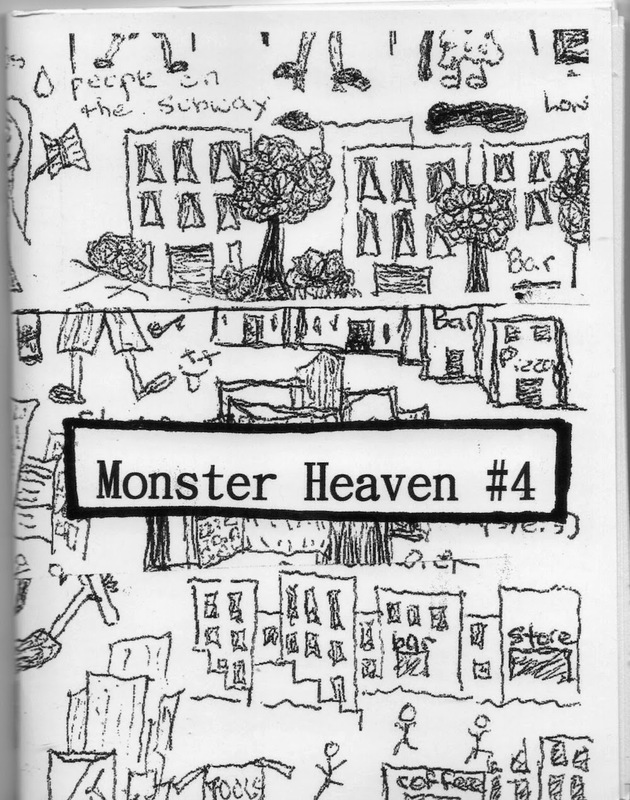 Monster Heaven #4 by Lauren Elizabeth is a prose memoir of a trip to New York. She goes into a lot of detail about the trip, and I found myself getting a little bored--it was a little like looking at someone else's slides from their trip. But the prologue, about the life and death of her friend and ex Chuck was quite powerful. This is a case where focusing on someone else might have been a better strategy. It would still would have been highly personal. This is the feedback I would have given Elizabeth if I were teaching a writing class. This brings up another problem with zines (and blogs like Pan)--they usually don't have an editor. Readers get the first draft. And while Monster Heaven #4 could have used some editing, it has a lot of strong points. Unfortunately, Monster Heaven #4 doesn't have any contact info for the author, and Google isn't turning anything up. If you are Lauren Elizabeth or know her, let me know and I'll put ordering information here. 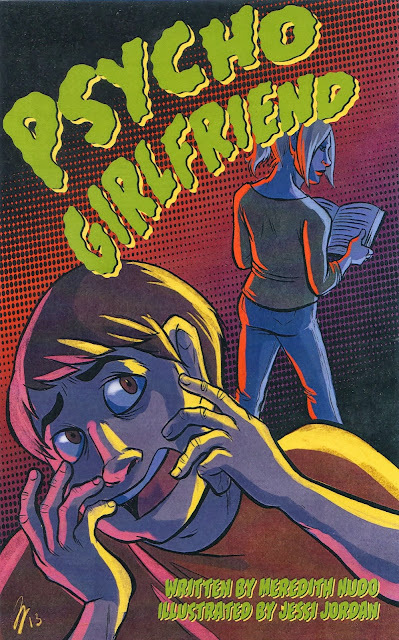 Psycho Girlfriend, written by Meredith Nudo and drawn by Jessi Jordan, is a very slick production. The drawing inside is as nice as the cover, but I am reluctant to show any of it because it would spoil the story. I won't say any more than that. It is a good little story about having a degree of skepticism about what your buddies might tell you. This comic was included as an insert in SPN: The Zine. This zine is a spin-off from a blog called Space City Nerd, which is devoted to mainstream comics and video games. Not totally my cup of tea, but the zine was well-done and Psycho Girlfriend is very accomplished. Given the content of Space City Nerd, you might have expected any comic associated with it to be more like Penny Arcade--aimed at nerd culture and possibly not accessible to those outside of it. But that's not the case at all, interestingly. 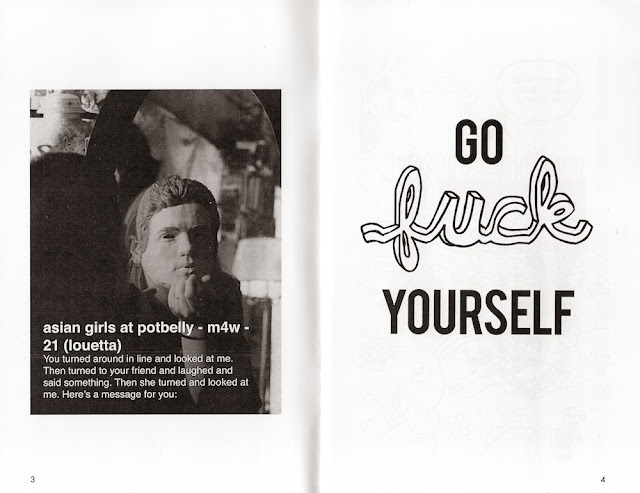 There are zines that have no particular focus or purpose. Often they are nothing more than seemingly random collages of modern printed detritus--the zine equivalents of Kurt Schwitters. 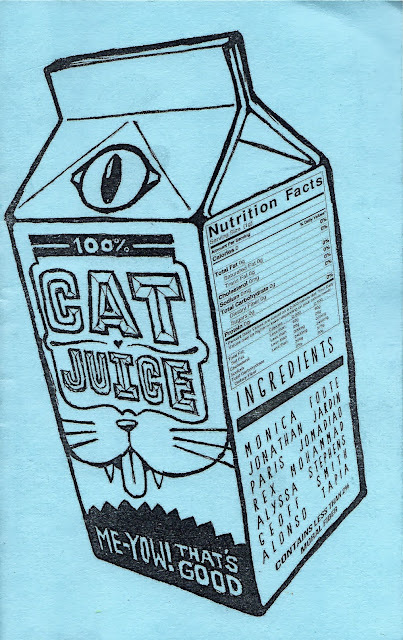 Cat Juice isn't quite that random, but it has a dada zine feeling. It is the work of seven artists/writers/bricoleurs: Monica Foote, Jonathan Jardin, Paris Jomadiao, Rex Mohammad, Alyssa Stephens, Geoff Smith and Alonso Tapia. The attitude is snotty, but it is beautifully constructed. I'm not sure how you can get a copy, but perhaps contacting one of the artists will do the trick. 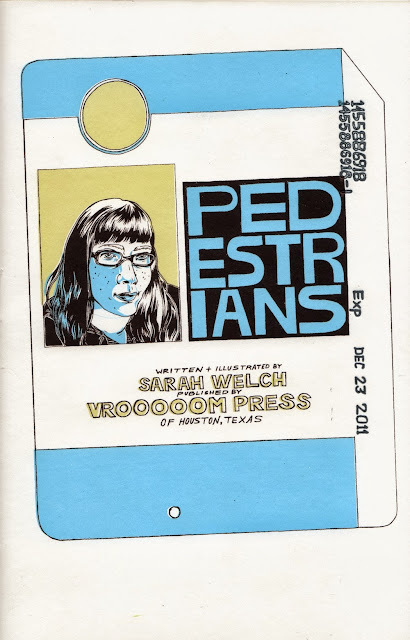 Sarah Welch's Pedestrians is from 2012. It seems to have been published as a sample piece for Vrooooom Press (which now goes by Mystic Multiples). And if this is why this zine got made, it strikes me as an excellent reason--to show off your printing skills! 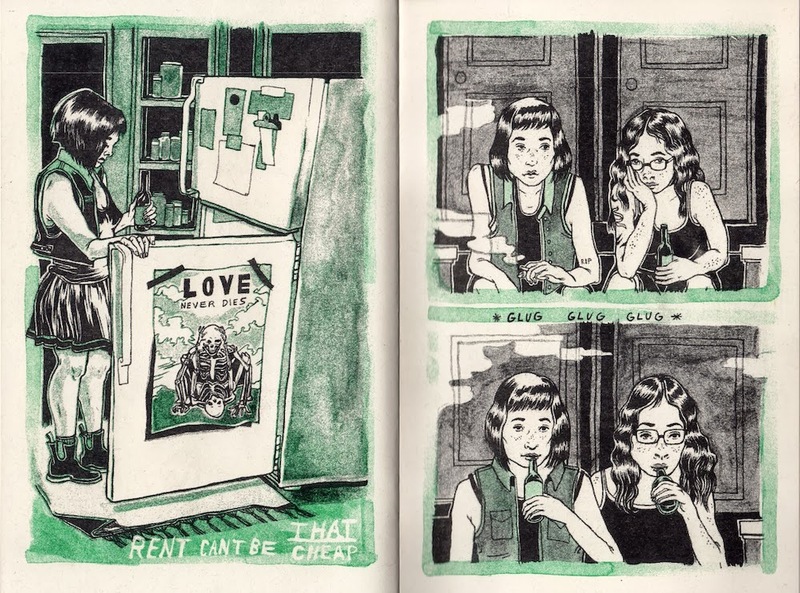 Welch is an illustrator and designer, and assuming the comics in this zine are autobiographical, she has lived in Chicago, Austin and Houston. This one-pager is typical of the work here. As a story, it is barely there. 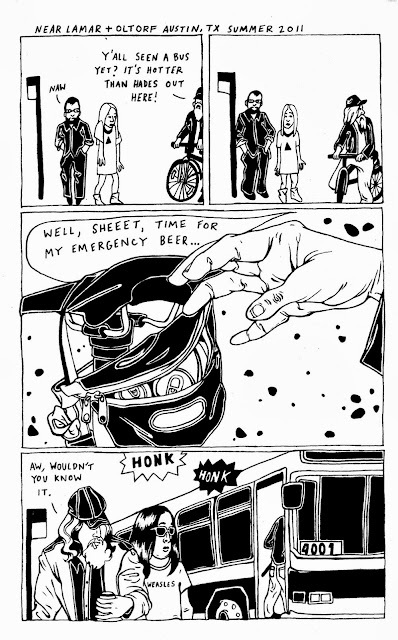 But like many of Harvey Pekar's shorter comics, this little episode gives you a flavor of urban life. This is one of the best things a comic can do, in my humble opinion. You can buy copies of it here. My favorite zine of the weekend was Endless Monsoon also by Sarah Welch (published by Mystic Multiples). It's from 2013 and it seems like a big step forward from Pedestrians. It may or may not be autobiographical, but it is realistic. A young woman has just moved into a new apartment (which appears to be a ground floor apartment in a fourplex), and it's not great. It leaks and has bugs, and the rain just won't stop. She thinks she may have made a bad decision. Welch tells part of the story in more-or-less straightforward comics form, but she also adds pages of collage elements, photographs, and patterns (like the pattern of linoleum tile). These elements slow it down and give it a meditative quality that is utterly appropriate to the story. Without being explicit, it uses the mise-en-scène and collage elements to beautifully convey the character's misgivings and regrets. The injunction to "show, don't tell" is overused in comics (and other storytelling genres), but Endless Monsoon is an superb example of the power of showing instead of telling. Welch's drawing seems stronger here than in Pedestrians. And her use of a second color--green--is quite creative. It sneaks in and out of the images as necessary. You can buy Endless Monsoon here. So why zines? Why does this subculture still exist in the face of the internet? 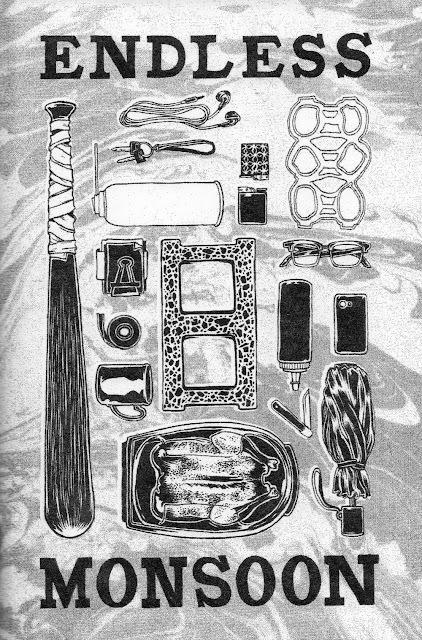 I think in part it's the pleasure of holding and reading these intimate little objects that motivates many of their creators--as well as the opportunity to congregate at events like Zinefest. Thanks for this write up, I was curious what kinds of zines were there. I keep meaning to go to / try and get a table at Houston Zinefest but something always comes up. Hopefully in 2014! I liked that there were a wide variety--wider even than the ones above (comics, prose memoir, drawings/illustrations, photos and interviews). There were political zines, poetry zines, a zine with instructions for brewing rice beer, weed zines and more. I tabled in 2012 and was not thrilled with the venue (Super Happy Fun Land) or the content available. It sounds like this year's event was markedly better. Austin Zine Fest is this weekend so I'm curious to see how that turns out. I think for next year they need to find a venue as nice as the Museum of Printing History, but larger. I suspect demand for table space will grow as others in the zine world hear about the success this year. She acknowledges that--a more organized volunteer staff and more spaced out tables will surely be needed. I look forward to whatever they decide to do. That's good to know. We'll have to make it to next year's event.